According to Google Trends, interest in content marketing has been on the rise since January 2011. But this should not surprise anyone. We all seem to be awash in content marketing. What’s surprising is that many content marketers don’t have a documented strategy. So, let’s fix that. Today, content marketer, we’ll help you get a plan in place. But first we need to clear up a little confusion about content marketing strategy. Some people like to make a distinction between the terms content strategy and content marketing strategy. The distinction, they suggest, is best explained with a Russian doll: a smaller strategy is inside a larger one. In this case, content marketing strategy is the smaller strategy inside the larger one, content strategy. Content strategy, according to Kristina Halvorson and Melissa Rach, involves the planning, creation, governance, and maintenance of content, whereas content marketing strategy focuses on the narrow discipline of marketing content. Fair enough, but I think this distinction is confusing and needless because we can also talk about content marketing strategy as the planning, creation, governance, and maintenance of content … and not lose any sleep. I’d like to proceed with a clear definition of a content marketing strategy. A content marketing strategy is a plan for building an audience by publishing, maintaining, and spreading frequent and consistent content that educates, entertains, or inspires to turn strangers into fans and fans into customers. Which brings us to the next important question. Do you need a content marketing strategy? If you are a small business with a few employees or a one-man or one-woman shop, you may be thinking that your content marketing is so simple that you don’t need a plan. Won’t a list of things that need to happen written on the back of an envelope get the job done? Yes, that’s one way to begin, especially if you are typically a perfectionist and just need to start your content marketing rather than waiting until you have the perfect plan. But at some point you will need to develop a more comprehensive plan — and then document it. Content marketers with a documented strategy feel more confident in their work. Content marketing challenges don’t seem as overwhelming when you have a strategy in place. A documented strategy makes it easier to get buy-in from stakeholders. It’s easier to chart your success when you have a documented strategy. The jury is in, folks: We all need a documented content marketing strategy. And the cool thing is it doesn’t need to be complicated. Let’s be honest: Unless you are a content marketer for a big company, you don’t need much. Just a plan to help focus your time, money, and energy. How will you distribute your content? Who will produce your content? Who is going to maintain the content? Who is responsible for the results? What’s your destination (core strategy)? Want to learn more about these questions and the process behind this simple content marketing strategy? Then check out the following article: 13 Simple Questions to Help You Draft a Winning Content Strategy. And don’t forget to download the accompanying free worksheet. There is one thing to keep in mind, though. You will probably have to perform some serious research before you can answer those questions. The person I’m talking about is your customer. Your customer is the focal point of your content marketing strategy. You need a substantial, deep, and comprehensive understanding of who she is. When you do, the strategy will write itself. You won’t have to guess or wonder. But a weak, flimsy, or flat-out wrong understanding of who your customer is will sink your strategy every time. Once you thoroughly understand who your customer is, evaluate the content you already have. This exercise will not only help you spot the gaps in your content that you need to fill, but it will also help you see that old content can become outdated and cost you top positions in search engines, cause user-experience failure, and more. Ultimately, it comes down to this: how do you know if your content marketing strategy is working? You’ll know if your content marketing strategy is working if you measure it. This is why question 13 on the content marketing strategy worksheet (What’s your core strategy?) is so important. For our Authority members, I want to point out an additional resource: Site Analytics Made Simple(r). This is a great introduction to understanding the tools you need to successfully measure your content marketing strategy. Authority members can access the webinar here. So, do you have a content marketing strategy? Is it documented or a plan you keep in your head? How did you go about creating it? Have any other tips you’d like to share with us to help other readers? Leave us your thoughts and questions in the comments section below. We look forward to hearing from you. I am going to take some content marketing strategy tips from your post. Thanks for sharing. You bet, Joe. Good to hear from you. And keep us posted on your progress. This was really helpful. I’m definitely an advocate of writing stuff down. This strategy will work nicely to expound on my current writing habits. 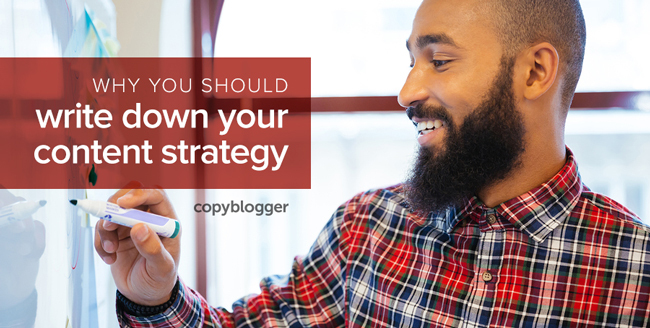 This article gave me an idea: Content marketing strategy needs to be the next Copyblogger Content Challenge! Excellent article, Demian! Instant follow in Twitter, too! You’re one of the most helpful and informative writers on the Rainmaker Digital Team and on the greater Internet that I have ever read and learned from! Thanks, JD, for the kind words, and yes, that sounds like a good idea for the next CB content challenge. Not sure what the others have up their sleeve … we’ll have to wait and see. But I’m sure they will like this idea, too. This article is extremely useful. Content is truly a barrier to inbound marketing for many businesses. I notice that many who produce content also do so in isolation without taking into account the needs to their clients. It’s extremely important to define the buyer persona to the letter and I like the way you the word “she” is brilliant! I find that many also make the mistake of thinking that they need to have and queue their content well in advance. This is not the case as sometimes, you will need to evaluate the performance of previous content before your produce the other. Content creation is a gradual work in progress. All excellent points you are making, Fran. Thanks for stopping by and commenting. great post with lots of helpful links to follow. I’m trying to develop my strategy but as you mention, first it’s about growing trust, having repeat readers and providing useful and entertaining content again and again. Thanks for this? Would you suggest I developing a longterm strategy for a beginner blogger, like me? Metrics should be use in every statement. The benefit of this approach is it provides a structure in which to create a strategy. Having that structure means your thinking suddenly has a path to travel that is mapped out in front of you. Creating the strategy is done faster and with less stress. Try it! You may like it. I even use this process to write speeches on the fly. Makes me fast! You’ve given us a lot to chew on here. I’ve applied a few of these exercises and found them beneficial, particularly answering those 13 questions and fleshing out customer personas. There are some other ideas here to consider. Appreciate you putting this together, kind sir. Thanks for this really useful article. I will surely be creating my own strategy now. Thanks for the post. I will be making use of the ideas here. I espishally liked the 13 questions listed, and will be making use of them.